Today, I am continuing with my glitter addiction. This is 2 coats of HazeGlaze Mystique over 1 coat of Barielle Berry Blue. I also used 2 coats of Nubar to seal it in and make it super shiny. 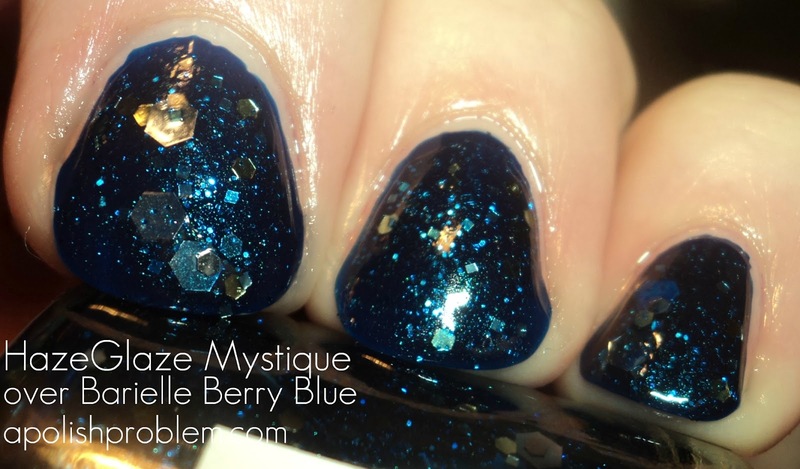 Mystique is gold, silver, and blue multi-sized and multi-shaped glitter in a deep blue jelly base. I applied it over Berry Blue, a deep blue jelly. I am in love with Mystique. It is absolutely mesmerizing (plus, I'm an X-Men nerd, so... bonus. LOL). I was also pleasantly surprised with drying time. Sometimes, hand-mixed glitters can be a bit slow to dry, even with quick-dry products, but not this one. Using Diamont and dry drops, it was dry in minutes. HazeGlaze is a small, indie polish brand that you can find on Etsy. Price was $8.79 plus $3.50 shipping. I love the color. I need to stay off Etsy.....I'm going to be broke soon!